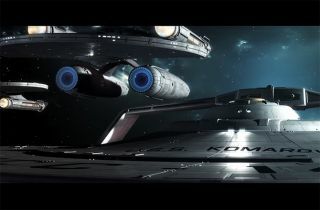 Screenshot from the fan-made film "Star Trek: Axanar." Watch "Prelude to Axanar" on YouTube. Production on a "Star Trek" fan film is stalled pending the result of a copyright lawsuit from CBS and Paramount. "The Axanar Works infringe Plaintiffs' works by using innumerable copyrighted elements of Star Trek, including its settings, characters, species, and themes," the original complaint read, according to a Dec. 30 report from The Hollywood Reporter. When asked for an interview with Space.com, a representative from Paramount emailed a joint written statement from CBS and Paramount to serve as comment on the lawsuit. "Star Trek is a treasured franchise in which CBS and Paramount continue to produce new original content for its large universe of fans," the statement read. "The producers of Axanar are making a Star Trek picture they describe themselves as a fully professional independent Star Trek film. Their activity clearly violates our 'Star Trek' copyrights, which, of course, we will continue to vigorously protect." However, it's unclear whether the funds raised from "Prelude to Axanar" constituted profit or if that had anything to do with the lawsuit. In previous interviews with Space.com, Axanar executive producer Alec Peters said "Star Trek" fan films are permitted by CBS and Paramount as long as those films do not return a profit. In 2014, his team released a 20-minute short called "Prelude to Axanar" that raised hundreds of thousands of dollars in support and featured shout-outs from "Star Trek" actors, such as George Takei (Sulu in the original series). When contacted by Space.com in late March regarding the lawsuit, Peters said his production company had initially offered to settle the lawsuit. He added that his law team, Winston & Strawn, believes Paramount's complaint is "too vague." "One of the things that's disappointing about this whole case is, we have 'Star Trek' fans who are excited about the new movie coming out," Peters said. "The director [for the 2016 CBS/Paramount 'Star Trek' film, Justin Lin] tweeted his support for us in the lawsuit." According to Peters, Winston & Strawn subsequently filed a motion to dismiss the lawsuit. CBS and Paramount responded, he said, by amending portions of the complaint. The new complaint alleges that copyrights were violated in matters such as the pointy ears and "distinctive eyebrows" of Vulcan, the gold-shirt uniforms of Federation officers, and the Klingon language, according to documents posted by The Hollywood Reporter on March 13. In the meantime, the production of "Axanar" is on hold pending the result of the lawsuit. If the lawsuit is resolved in the film's favor, Peters said, production will still be delayed, as it would take a couple of months to organize everything, including coordinating the actors' schedules and resuming work on elements such as the costumes. Winston & Strawn filed a new motion to dismiss on March 28. In a published response from Loeb & Loeb attorney David Grossman, who represents CBS and Paramount, the lawyer was quoted in 1701news.com on April 12 as saying the individual copyright claims quoted by the producers of Axanar are out of context. "This is precisely the tactic that courts have admonished, because it 'misses the forest for the trees,'" Grossman wrote, adding the copyrighted elements from CBS and Paramount "have already been fixed in the Axanar works for the court to determine, at the appropriate time, that there is no fair use." As an example, Grossman said that every time the U.S.S. Enterprise appears on screen, Star Trek copyright is being infringed. He also said that Vulcans and phasers, although they have roots in mythology and other science fiction works, are copyrighted because they are a part of the Star Trek universe as a whole. Editor's note: This story was updated April 21 to reflect recent developments in the CBS/Star Trek: Axanar copyright suit.